We invite you to explore India - the Land with infinite beauty ! Whether you soar high into Himalayas or peer under the ruins of the Ancient monuments dotting the landscape of India, you will cherish the experience long after your visit ! This India Travel Guide on Thiruvannamalai temple is free from any commercial interest! This site is dedicated to promote India - the vast subcontinent, its glorious past, magnificent landscape and its infinite variety. As one of the biggest and grandest temples in South India, Thiruvannamalai, true to its name has the hill as background and appears like a fort when viewed from a distance. Renowned as one of the 'Pancha Boodha Stalams', (the five nature attributes namely earth, water, fire, air and ether), you find the Agni Sthalam in Thiruvannamalai. Paeans have been sung about this temple by famous Saiva saints and poets from Sundarar and Manickavasakar to Appar and Thirugnanasambandar. The presiding deity is Lord Arunachaleswara and the temple is referred to as Padal PetraSthalam'. Consecrated to the Lord of Light, this temple is popular as the capital of Saivism and Saiva cult. Otherwise called 'Annamalaiannal', it is the most sacred of the names of the manifestation of Lord Siva, the great God of all countries. There are twenty two places for salvation in the Shaivite tradition and Thiruvannamalai is the most sacred of them. One of the four Shaiva saints who visited Thiruvannamalai, Manickavasakar lived here for long period and composed Thiruvempavai-20 and Thiruvammanai. That is why even today, there is a temple for Manickavasakar at Girivalam path called Thirumurai Thalam. 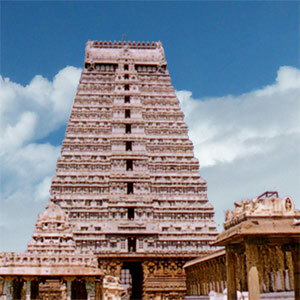 Thiruvannamalai temple is the result of more than nine centuries of building process. One can trace the dates of work from the inscriptions engraved on the walls since the 10th century. The temple was started by the Pallavas and the Cholas. Later it was taken up by the Vijaynagar kings who built the Rajagopuram. This was later completed by the Nayaks of Thanjavur. The temple has its main entrance from the eastern end where there is a Raja Gopuram. This tower is situated on the outer wall and it dominates the eight other towers which crown the gates at the four cardinal points. Raja Gopuram is about 54 m tall and is made of stucco coated bricks that have a massive stone at its base. The stately towers, the high rampart walls and the spacious gateways and mandapams give the temple an architectural splendor and sculptural beauty. The temple has four stately towers on all four sides. The southern tower is called Thirumanjagopuram, the western one Peygopuram and the tower on the north, Ammaniamma Gopuram. The temple occupies about 25 acres of land. The Rajagopuram which adorns the eastern gateway is 217 feet high with 11 storeys with a base measure of 135 feet by 98 feet. The courtyards in the temple are said to be seven, starting from the centre and it is said five were built and first one disappeared in the course of nine centuries. Then the sixth one appeared, and this is represented by chariot streets around the temple and seventh is the road surrounding the hill. All the shrines dedicated to the deities are oriented to the east. At the southern extension of the courtyard is the kitchen where offerings to the Lord are prepared. The inner most shrine or Garbha Graha is in the form of 'Lingam'. This is in the form of an upright stone, square at the bottom, octagonal in the middle and cylindrical with a rounded top. Mythology has it that there was an unsettled dispute between Lords Vishnu and Brahma as to who was superior. They sought the help of Lord Siva to judge. Lord Siva grew into a long flame and stretched between earth and heaven and asked them to find root and crown. While Brahma agreed to reach for the crown took the form of a swan and flew, and Vishnu agreed to find the root and took the form of a pig and kept digging down to reach Siva's foot. Brahma caught a flower of the Pandavas falling from Shiva's crown and urged the flower to falsify that it was collected from Shiva's crown directly. Brahma was then cursed by Shiva never to be worshipped. The Pandava flower was also banished from Shiva's adornment. Shiva was pleased with Vishnu's humility, revealing that to be blessed with true knowledge, there should be utter destruction of ego. This festival is celebrated with great fervor in this temple. As per legend Lord Siva himself manifested in the form of a column of fire for the sake of mankind. This later transformed into the sacred hill Arunachala. The hill is still worshipped as a manifestation of Lord Siva and this festival has been held from time immemorial to commemorate this event. For ten days numerous ceremonies take place and culminate on the tenth day. Thousands of devotees crowd at Thiruvannamalai to have a glimpse of the holy beacon lit on the summit of the hill. Deities of Siva, his consort Parvati, Ganesha, Muruga are worshipped as they are taken in a procession with great pomp. The deities are adorned by gold and stone ornaments. Aroma of camphor and incense permeates the air and beats of the drum echo the devotion of the pilgrims.